2. When can you start? 3. When will the work be finished? While these are three great questions, they simply do not provide you with enough information about a particular contractor to enable you to make an informed, intelligent decision. The fact of the matter is that you need a Gutter Specialist and not just any old installer. Any “Chuck in a Truck” can get a license and slap a sign on his truck and say that he can install gutters. But how do you know for sure? Will the Gutter Specialist require all change orders to be in writing to eliminate any misunderstandings and unexpected cost overruns? Does the Gutter Specialist carry general liability insurance? Does the Gutter Specialist carry worker’s compensation insurance? Is the Gutter Specialist a member of the local Better Business Bureau? Does the Gutter Specialist offer a lifetime warranty? Who will be in charge of my job? May I meet this person or persons? Has the Gutter Specialist been a party in any construction litigation in the past five years? Will the Gutter Specialist provide you with adequate references? How many projects like yours has the contractor completed in the last year or two? How is daily and general clean-up handled? Will the Gutter Specialist provide a Jobsite Communication Board that is checked daily for any questions or concerns you may have thought of after working hours? Q: Why Do I Need Gutters? A: Gutter protection systems don’t get a huge, flashy fanfare, but they are extremely important for protecting your home. 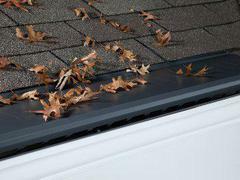 Recent studies show that gutter protection can lead to an extension of the life of the component parts of your home. Every homeowner has a responsibility to protect their gutters because old, damaged, or defective gutters can be detrimental to the house on a whole. If gutters are clogged or don’t drain properly, the water pours over the gutters either to the foundation or the house itself. This can lead to ice building up in and around the foundation as well as pockets of standing water. Combined or individually these issues can cause foundation problems, wood rot, landscaping erosion, and a myriad of other issues. Damage as a result of any one of these can set back a home owner quite a lot in terms of time and money, it only grows exponentially if your clogged gutters cause more than one issue at a time…as it often does. You can easily avoid all of these problems by installing a “total gutter protection system” like those sold here at Gutter Topper of KC. Not only do clogged gutters present a hazard to your home, but they also pose a danger to your family. Clogged gutters provide a great breeding ground for mosquitoes and other pests as well as a perfect habitat for potentially harmful mold and mildew. Our “total gutter protection system” is specifically designed to prevent the staining and rotting of house walls, keeping basements dry, protecting windows and siding from potentially harmful backsplash, and to keep your trim, fascia, and other roof items from sitting in standing water. Gutter Topper of KC is dedicated to making sure your home is beautiful, clean, and safe. Q: What Are Reasons for Considering Gutter Replacement? A: Leaky or clogged gutters lead to basement and foundation problems, and are one of the biggest causes thereof. Standing water in gutters can lead to an infestation of mosquitoes and other disease-causing pests. The look of your property will determine the value. Old and ugly gutters detract from your home’s value. When gutters have become detached from the house, it is likely that there will come a time where these unsightly hanging eyesores can no longer be reattached and it would be better to simply replace them. Drippy leaks from old, seamed guttering would make it a good candidate for replacement. Your gutter color doesn’t match your roof or you want to change the color for effect. The gutter installed does not suffice to securely drain off the current rainfall that your roof has. Q: How Do I Know Whether My Gutters Are Draining Properly or Not? A: When there is heavy rainfall, if you can hear the pattering of falling water, it may point to signs of a blockage and overflow of water in the gutters. Paint peeling or corroded wood are also signs of poor performance by your gutters. Mold is another surefire way to tell that your gutters are not performing as expected. Lastly, gutters should drain approximately six feet away from your homes foundation. If you find standing pools of water within that six foot ‘safe-zone’ you might have a gutter drainage issue. Q: GutterTopper® – What is It? A: GutterTopper® is a gutter protection system that doesn’t require you to replace your existing gutters. It simply installs on top of what’s already there. This remarkable, revolutionary system not only blocks pine needles and other debris from plugging up your gutters, but also allows a free flow of water through it. By extension, it promotes a much cleaner living environment and prevents your gutters from becoming a possible health hazard. GutterTopper® ensures that you won’t have to climb that roof to clean out your gutters. No more worrying about falling off the roof, or having your ladder fall down and be stranded on top of your house. While this may not been much of a concern to younger home owners, it is of a great concern to seniors. GutterTopper® is far better than its competitors. GutterTopper® is so well-built that it’s no wonder that it’s protected by a lifetime warranty. GutterTopper® protects more homes than any other gutter protection system available on the market today! Q: What’s the Secret Behind Gutter Topper’s Effectiveness? A: Gutters are supposed to drain the water off your roof when rain falls. When gutters become clogged with leaves, needles and other debris, water can’t flow freely and you have a runoff problem. When gutters get clogged, they can damage your home, your yard, and can even pose a serious health risk to you and your family. Just think about the number of mosquitoes and other bugs that can proliferate in pools of standing water in your gutter. GutterTopper® uses a well-known scientific principle to make the GutterTopper® the best gutter protection systems on the market today – water surface tension. The same principal that allows a 100,000 TON United States Navy aircraft carrier float on the “surface” of the water is the very same principle that GutterTopper® uses. In fact there is a government website that publishes an entire “international table of surface water tension,” and it is this unique property of water that causes water to “cling” to a surface. Through our trade marked processes GutterTopper® allows water to cling to its surface, allowing the free-flow of water all the way to your drains. All the other debris, pine needles, leaves and the like, fall onto the ground. Q: What Are the Positive Benefits of GutterTopper®? Safeguards against mold, mildew and harmful fungi by ensuring there is no moist space under your eaves for them to flourish. What’s more, you can keep your feet safely on the ground and don’t have to find yourself climbing a rickety ladder to remove gunk from your gutters every couple of weeks! Or Worse: Trying to get the snow and ice out of your gutters during winter storms. Q: Are GutterTopper® Systems Affordable? A: The real question you should be asking is if you can really afford NOT to install GutterTopper®. Given the amount of damage a clogged gutter can do to a home, it's always cheaper in the long run to be Pro-Active than Re-Active. How does that old saying go… An ounce of prevention is worth a pound of cure… think about it. Do you want to pay for a complete gutter protection system now or do you want to pay for a gutter protection system after your home is damaged and you have to pay for costly repairs, plus a new gutter system? With that being said, this is a simple answer really – No more worries about cleaning your gutters! You don’t have to clean out that gunk-filled gutters, and you don’t have to hire someone to do it for you either. No more shaky ladders for you or anyone else, no more fire hazards, and no more worry. Overflowing gutters would be a thing of the past, ensuring that you don’t have to worry about fascia rot, health hazards or severe building and foundation damage due to overflowing. Limited maintenance is the name of the game and GutterTopper® provides peace of mind with a limited maintenance system, what more needs to be said? Keeping your gutters clean with a minimum of fuss is a good enough reason for you to invest in GutterTopper®, let alone the protection it affords your home. Q: Will Installing GutterTopper® Affect My Roof Warranty? A: No. The installation method used by our technicians have been inspected and approved by major roof manufacturers. The installation system for GutterTopper® is done by trained professionals using the industry’s highest quality poly-butyl sealant. Both your roof and your warranty remains intact and in good hands. In fact, you can learn more about how your warranty remains intact by visiting our GutterTopper® Product Page. Q: How is GutterTopper® Different from Gutter Screens and Other Gutter Protection Systems? A: The major difference comes from the fact that GutterTopper® doesn’t use vertical openings of any sort. As long as a system contains openings for flow, there will be a need to clean it because the openings will eventually become clogged and impassable. 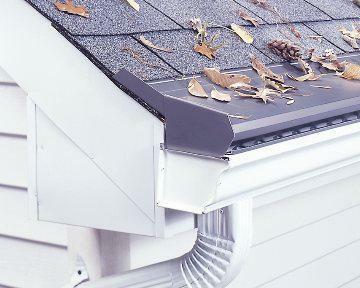 GutterTopper’s unique design is built to ensure that no vertical openings allow for debris to enter your gutters, keeping them safe and secure. Leaves fall to the ground and the surface tension of water allows it to flow easily into the system and drain away quickly and efficiently. Q: Is There a Specific Type of Roof That GutterTopper® Works With? A: No, GutterTopper® is designed and built to be used with any type of roof. Whether your roof is slate, cedar shake, ceramic tile or metal, your gutters will collect water easily once GutterTopper® is installed. A: Using Industry-certified methods, GutterTopper® has been verified to be able to handle up to 1200lbs per square foot. GutterTopper® can support your weight as well as the weight of your closest friends without collapsing! Q: Is It Available in Different Colors? A: There are currently 13 distinct different colors available, including Copper. Depending on the color of your roofline, you can find a color of GutterTopper® to match it, making it seamless and virtually invisible to passers-by. Q: What Kind of a Downpour Can GutterTopper® Handle? A: GutterTopper® can safely handle up to 22 inches of rainfall per hour. That’s twice as much rain that has ever been recorded in history to date. Q: Can It Handle The Snow of a North Dakota Winter? A: Snow is not a problem for GutterTopper®; it can handle whatever Mother Nature can bring. With a pressure testing of 1200 lbs. per square feet, there is no snowfall that can bring GutterTopper® down. Furthermore, if you use GutterTopper® in combination with the patented Hott Topper®, you will always have a worry free gutter system that can handle any amount of snow or water. Q: Do Ice Dams and Frozen Gutters Affect It? A: Clogged gutters, during colder months of the year, can turn into solid chunks of ice and cause the gutter itself to detach from your house. The damage and cost of repair is usually immense. When ice builds up under the roof edge, it is known as an ice dam. This ice slowly creeps, all the way up to under the shingles, leading to warping. As time passes, the ice could cause rotting roofs and a prevalence of leaks. Poor attic ventilation coupled with poor roof installation perpetuates and exacerbates this problem. Specialized GutterTopper® installation teams can include a self-regulating heat cable that can serve to prevent the damage caused by ice dams and frozen gutters: We call it Hott Topper®! Q: What's the Installation Procedure for GutterTopper®? A: Our professional installation team first cleans, re-align, re-secure and re-seal where necessary. 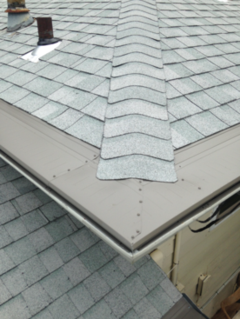 GutterTopper® is mounted under your existing roof shingles, depending on how your roof is constructed. The estimated time of completion usually averages out to one day. Q: What Warranty does GutterTopper® Have? A: Simple Answer: Transferable Lifetime Warranty. GutterTopper® holds the transferable warranty valid for the entire lifetime of the home. A: - Leaky or clogged gutters lead to basement and foundation problems, and are one of the biggest causes thereof. Standing water in gutters can lead to an infestation of mosquitoes and other disease-causing pests. - The look of your property will determine the value. Old and ugly gutters detract from your home’s value. - When gutters have become detached from the house, it is likely that there will come a time where these unsightly hanging eyesores can no longer be reattached and it would be better to simply replace them. - Drippy leaks from old, seamed guttering would make it a good candidate for replacement. - Your gutter color doesn’t match your roof or you want to change the color for effect. - The gutter installed insufficient to securely drain off the current rainfall or melted snowfall that your roof is subjected to. GutterTopper® installation teams can install larger gutters if needs be. Experts have stated that gutter cleaning can set a home-owner back $75 for an average sized house and that gutter cleaning should be done twice yearly. Q: Can I Really Save Money Installing GutterTopper®? Experts have stated that gutter cleaning can set a home-owner back about $75 for an average sized house, about 150 linear feet of gutters, and that gutter cleaning should be done at least every 3 months depending on your location. That’s about $300 per year on average, sometimes more, you spend on cleaning gutters. Over a course of 10 years, that’s $3,000. With GutterTopper®, you avoid that cost. But what about if you clean your own gutters? Well, how much money is your free time worth? Do you want to spend your free time climbing up on a roof and cleaning gutters, or would you rather be watching the big game on tv, playing with your kids, or spending quality time with your significant other? How do you put a price tag on that?